Report-back about the demonstration against evictions, gentrification and the G 20 in Berlin last night. Last nights demonstration started around 09:00pm in Berlin’s Friedrichshain district with about 400 people. First the loud demo marched to the fallow land near Rigaer street 71-71 where the CC groupand another consortium are planning to build a hotel and luxury apparments. The demo had grown and now around 1000 people marched toward the Kreuzberg district. We planned to march through Görlitzer park which is (tohether with Rigaer street) a key point of police repression, but the parc was sealed off and so the demo had to march around the park. In front of the occupied Ohlauer school we stopped and the “International Women Space” held a speech. From there the demo marched towards Friedel 54 in the Neukölln district. Friedel 54 is under immediate eviction threat. The demo ended at Hermannplatz, where a police squad attacked and arrested one person. It seemed that the cops used the demo to train for the Mayday demo, which will be an unregistered demo in Berlin this year. During the demonstration a huge cop army hard-pressed protesters permanently. Especially the people at the front of the demonstration were thwarted, offended, pushed and beaten by a squad of riot cops. The complete performance of the police correlated with their announcement in mainstream media that they would use the demo to train for the first of May. 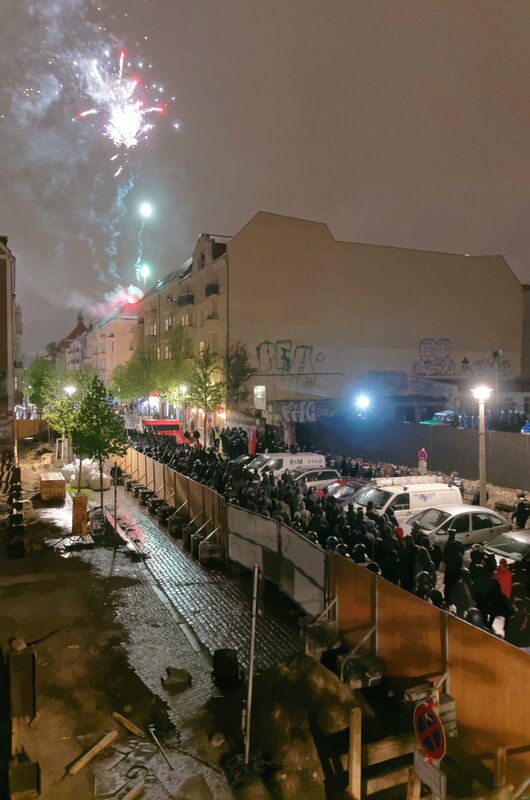 The organisers of the demonstration had announced that in case of an eviction of Friedel 54 before the demo took place, it would be a night full of stress. Because Friedel 54 is still not evicted, the demonstration stayed peaceful, but still was loud and powerful. However the police cordon around the complete demo prevented direct communication between protesters and bystanders. There was no real concept how to deal with the repressive concept of the riot cops. At some point 1500 people were marching and although the cops had surrounded the demo permanently, the athmosphere was good and the demo stayed loud. Considering that there was no recent police raid or eviction, the repressive approach and announcements by the cops and the pouring rain that kept on falling on our heads, the demo was a success. Various initiatives called for the demo and agreed to connect the struggle against gentrification with the struggle against the G 20 summit later this year. The struggle against gentrification is far from over and should not end with marches through Berlin. Apart from decentralized actions, autonomous groups could develope more offensive concepts for open mobilised demonstrations like the one last night. People are looking forward to the unregistered Mayday demo in Berlin next week and the days of action against the G 20 in Berlin, which will take place from the 2nd until the 10th of June. The days of action in Berlin are a kind of warming-up for the protests during the G 20 summit in Hamburg in July. But the action days in Berlin are also a sign that we don’t need a summit to resist capitalism, we can and must organise ourselves and resist permantly against capitalism. #NoG20: 3500 People Protested During & After #StPauli Game in #Hamburg | Enough is Enough!